All paid P3 orders have been filled! That’s a small sentence, but it was no small feat, and it’s just the beginning of Multimorphic’s journey in the pinball/gaming industry. With 2 full game kits and 3 additional mini-games shipping now, another full game kit and 3 more mini-games shipping soon, and even more projects underway both by us and 3rd-party developers, our full vision for the P3 ecosystem is taking shape. Our production team is starting to build P3 and game kit inventory so we can ship to order. Put in an order today, and we’ll ship your machine in 2-3 weeks (depending on order volume). We’re also building up our sales and distribution network to help introduce everybody to this revolutionary pinball platform and to make it available for purchase around the world. We’re proud to announce that Joe Newhart of PinballSTAR Amusements is now selling P3s. Joe shares our passion for pinball and brings an incredible work ethic and dedication to everything he does. Like us, Joe says what he means and does what he says, and he now says he’s selling P3s! Joe will have a P3 available for play at ReplayFX July 26-29 in Pittsburgh, PA and at future shows and events in or near the American Northeast. Contact him at sales@pinballstar.com, 570-357-0042. Welcome to the team, Joe! In addition to working with distributors to help show off the P3 around the world, we’re offering incentives for all P3 owners to share their P3 at local pinball and gaming events. If you own a P3, take it to an approved pinball or gaming event, and we’ll give you $200 worth of 50% off credit ($100 value) at our store at http://www.multimorphic.com. To participate in this program, please email info@multimorphic.com with the name and information about the event for approval. This offer extends retroactively to people who have taken their machines to shows in the last year. Where else can you see the P3? Check out Buffalo Pinball’s twitch streams at twitch.tv/buffalopinball. Kevin and Nick are doing weekly streams of the P3. 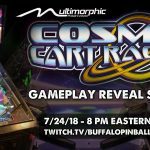 So far they’ve shown Lexy Lightspeed – Escape From Earth and Secret Agent Showdown, ROCs, Barnyard, Cannon Lagoon, and Grand Slam Rally, and I’ll be joining them in Buffalo, NY on July 24th at 8pm ET for the streaming debut of our latest full game, Cosmic Cart Racing. Be sure to check it out! Thanks also to Jack Danger of Dead Flip (twitch.tv/dead_flip) who streamed Lexy Lightspeed – Escape From Earth twice in June and to Buffalo Billiards in Austin, TX for including the P3 again in the Bat City Open and streaming it live to the world. What’s going on in development? We’ll soon be wrapping up work on our first major software update. In addition to fixing bugs and adding new features to our released games, this update will set the stage for a more structured app update schedule. Skipping over the technical details, the platform nature of the P3 requires a lot of low level development work to ensure that games kits, applications, hardware features, and advanced software features like our player profile and networking systems all work together seamlessly. This first update standardizes most of that infrastructure and will help make future game development easier. It’s our goal to foster a growing community of independent P3 game developers; so we’re handling all of the framework functionality so that independent game developers can spend their time implementing fun content and gameplay. Related, the P3 Software Development Kit is now in final beta testing. Early access developers are using it now, and we’re looking forward to its public release. Help us grow! Join the Multimorphic team! We’re looking to add a business development expert to our team. If you have experience with and enjoy fostering business and sales relationships, if you’re passionate about pinball/gaming and technology, and if you want to be part of a small team doing big things, please email me directly at gstellenberg@multimorphic.com. If you’ve had a chance to play a P3, please email us your thoughts at info@multimorphic.com. We’re always interested in knowing what features you love, what’s your favorite P3 game, what you’d like to see improved, and what impact you think the P3 can have on the pinball/gaming industry.